CARF has issued three-year accreditations for the Adult Intensive Outpatient Treatment for Integrated Substance Use and Mental Health Treatment and Adult Outpatient Treatment for integrated Substance Use and Mental Health Treatment offered by our Healthy Partnerships division. These are Caminar’s first accreditations for these services. This outcome was the result of dedicated work on the part of our Solano Region’s leadership, the Healthy Partnerships team, and our Operations teams. By pursuing and achieving accreditation, Caminar has demonstrated that it meets international standards for quality and is committed to pursuing excellence. An organization receiving a Three-Year Accreditation has put itself through a rigorous peer review process. It has demonstrated to a team of surveyors during on-site visits its commitment to offering programs and services that are measurable, accountable, and of the highest quality. We are pleased to share with you our spring edition of edition of Caminar Connections, our newsletter highlighting all that our supporters help to make possible for people in our communities in need. This newsletter shares highlights of our 2018 Annual Report, including our fiscal year 2018 statement of financials, highlights, and impact. In addition, this edition features the story of Eddrena, who with the help of Caminar’s Supported Housing Program, has finally found a safe place to call home, heal from past trauma, and move forward in health and wellness. Thank you to all of our supporters and donors who help to provide life-changing services to individuals and families as they move toward resilience, wellness, and independence. We’re delighted that bestselling author and advocate David Sheff will be the featured speaker for the 16th Annual Circle of Support Luncheon. David Sheff is the author of Beautiful Boy: A Father’s Journey Through His Son’s Addiction and Clean: Overcoming Addiction and Ending America’s Greatest Tragedy. Clean, a follow-up to Sheff’s New York Times #1 bestseller Beautiful Boy, is the result of the years he spent investigating the disease of addiction and America’s drug problem, which he sees as the greatest public health challenge of our time. Beautiful Boy, published in 2008, was based on Sheff’s article, “My Addicted Son,” which appeared in the New York Times Magazine. The article won a special award from the American Psychological Association for “outstanding contribution to the understanding of addiction.” Beautiful Boy was made into a film, released in October 2018, directed by Felix Van Groeningen and starring Steve Carell and Timothée Chalamet. Sheff also contributed to HBO’s Addiction: Why Can’t They Just Stop. HIGH: Everything You Want To Know About Drugs, a book for young adults written with Nic Sheff, published in January 2019. He is currently working on his next book, The Buddhist on Death Row: Finding Light in the Darkest Place. Sheff is on the advisory boards of the The Jed and Clinton Health Matters Campus Program “designed to help colleges and universities promote emotional well-being and mental health programming, reduce substance abuse and prevent suicide among their students,” and the International Bipolar Foundation. Along with the New York Times Magazine, Sheff has also written for such publications as the New York Times, Wired, Rolling Stone, Outside, and the Los Angeles Times Magazine. He has conducted seminal interviews with John Lennon and Yoko Ono, artist and dissident Ai Weiwei, nuclear physicist Ted Taylor, Congressman Barney Frank, Steve Jobs, Tom Hanks, Betty Friedan, Keith Haring, Jack Nicholson, Carl Sagan, Salman Rushdie, Fareed Zakaria, and others. He also wrote an award-winning documentary about John Steinbeck’s The Grapes of Wrath, and a radio special about Harper Lee’s To Kill a Mockingbird, both for National Public Radio. Sheff graduated from the University of California, Berkeley, and lives with his family in Northern California. The Circle of Support Luncheon will be held on April 26, 2019. Find out more about the event here. Because of you—our donors, community partners, government funders, volunteers, and friends—individuals and families receive the care they need to be empowered and supported as they move toward resilience, wellness, and independence. Thank you. We are pleased to share with you our 2018 Annual Report, which details the life-changing work you make possible. As you may know, the Caminar family has grown by welcoming Family & Children Services of Silicon Valley, Project Ninety, and Healthy Partnerships. These mergers have expanded our reach and strengthened our capacity to help our most vulnerable neighbors toward an improved quality of life. This Annual Report reflects the combined organization and the combined impact: Last year, with your support, we reached more than 20,000 people of all ages with education, treatment, and support that prevent and promote recovery from complex conditions, including mental health, substance use, and family violence. Thank you for your compassion and generosity. Because of you, our most vulnerable neighbors have comprehensive support on the path to wellness. Craig Wiesner, Karina, and Derrick Kikuchi in front on Reach & Teach on 25th Avenue in San Mateo. With the help of Caminar Jobs Plus, Karina has found gainful employment, self-esteem, and confidence to continue her education and fulfill her dreams. Before Caminar, Karina—a 19-year-old student at the College of San Mateo—was shy, antisocial, and had trouble being independent. Going out by herself caused anxiety. Referred to Jobs Plus from the Department of Rehabilitation, Karina worked with her Caminar Job Coach to determine the type of work she’d like to do. She realized that working in a small, family-owned retail environment would suit her well. With the guidance of her coach, Karina learned skills for interviewing and working in retail and began to believe in herself. Today, Karina works at Reach & Teach, an independent book, toy, and fair trade store on 25th Avenue in San Mateo, where she has been for almost a year. She helps with pricing, creating displays for products in the shop, customer purchases, and a variety of data entry tasks. Reach & Teach Co-Founders, Derrick Kikuchi and Craig Wiesner, feel blessed to have Karina working with them. She is wonderfully dependable, thorough, thoughtful, and has become an integral part of their team. Staying in school, continuing to work at Reach & Teach, and earning a degree in Psychology is Karina’s goal. She is grateful to her Jobs Plus team for helping her to achieve something she was previously so afraid to do. And, we are all delighted to see Karina thriving in work, school, and life. Black History Month is celebrated each February to honor, recognize, and acknowledge African Americans in the United States. As a behavioral health organization, we also feel it is important to address mental health in the African American community—not just in February but all year long. A recent opinion piece by Taraji P. Henson, actress and the founder of The Boris Lawrence Henson Foundation, states "Mental health isn't talked about in our community, people don't seek it out as a career option. So we don't have a lot of therapists out there, and those who are practicing are not easy to find. I want to change that." She goes on to mention it’s essential for the therapist to be culturally competent. Featured on NBC News, the piece is entitled Black communities aren't getting the mental health care they need. I'm helping to break the silence. ● NAMI features this African American Mental Health page with stories, statistics, and resources focused on how mental health affects the African American community and ways to find help. ● Each Mind Matters, California’s Mental Health Movement, provides mental health resources and information for diverse communities, including this page focused on the African American community. ● Mental Health America highlights a comprehensive guide to Black & African American Communities and Mental Health that includes statistics, details on prevalence and attitudes, treatment issues, as well as educational and help-related resources. We hope the discussion of mental health in the African American community, and across all communities, continues. Together, we can increase awareness of mental health wellness, and support and empower vulnerable members of our communities. Special thanks to Jonay Grant, Caminar Supported Education TAY Program Coordinator and a member of our Diversity & Equity Committee, for her valuable contributions to this post. Happy Valentine’s Day! Thank you for sharing your heart with us. Thank you for sharing your heart with vulnerable members of our community. Your generosity and support changes lives. Please meet our new CEO, Mark Cloutier, who has a special message of gratitude for you. resilience, wellness, and independence last year. Happy Valentine’s Day, and thank you from all of us at Caminar! After an extensive search, the Board of Directors is excited to announce that Mark Cloutier, MPP, MPH, has joined Caminar as CEO as of January 31, 2019. Mark brings a unique set of skills and experience to his role at Caminar. With Master’s degrees in public policy and public health, he has extensive experience in leadership roles in esteemed nonprofit and philanthropic organizations in the Bay Area, including Horizons Services, San Francisco Foundation, the Center for Youth Wellness, Kaiser Family Foundation, and San Francisco AIDS Foundation. Mark has dedicated his career to increasing access to quality health and supportive services and improving communities’ overall health and well-being. Read today’s press release announcing Mark’s appointment here. We’re thrilled to announce that bestselling author and advocate David Sheff will be the featured speaker for the 16th Annual Circle of Support Luncheon. Beautiful Boy, published in 2008, was based on his article, “My Addicted Son,” which appeared in the New York Times Magazine. The article won a special award from the American Psychological Association for “outstanding contribution to the understanding of addiction.” Beautiful Boy was made into a film, released in October 2018, directed by Felix Van Groeningen and starring Steve Carell and Timothée Chalamet. Sheff also contributed to HBO’s Addiction: Why Can’t They Just Stop. HIGH: Everything You Want To Know About Drugs, a book for young adults written with Nic Sheff, published in January 2019. He is currently working on his next book, The Buddhist on Death Row: Finding Light in the Darkest Place. David is on the advisory boards of the The Jed and Clinton Health Matters Campus Program “designed to help colleges and universities promote emotional well-being and mental health programming, reduce substance abuse and prevent suicide among their students,” and the International Bipolar Foundation. He graduated from the University of California, Berkeley. David lives with his family in Northern California. Our Solano Wellness and Recovery Center (WRC) is an always-active and inviting peer-run drop-in center for individuals with a known or suspected mental illness. Currently, the WRC is engaged in NAMI Peer-to-Peer. NAMI Peer-to-Peer is an eight-week educational program for adults with mental health conditions who are looking to better understand themselves and their recovery. The program is taught by trained leaders with lived experience, and includes activities, in-depth discussions and informative videos. Caminar Solano staff and our WRC clients are delighted to be part of this training. Our gratitude to Dove McKinnon, our WRC Program Coordinator, who arranged the training series. Happy New Year! We hope your 2019 is off to a wonderful start. Your support makes so much possible for our clients, including the opportunity to express and heal themselves through the arts. This beautiful photograph of the Golden Gate Bridge was taken by a client in our Expressive Arts program, which offers group workshops with Teaching Artists, including world-renowned photographer Michael Collopy. Bridges are rich in symbolism, emblematic of connections, progress, and transitions. This photo represents the photographer's personal journey of wellness and recovery, made with the help of Caminar, while also invoking the journeys of clients and their families across our organization, and even our own. 2018 was a year of great connections and progress for Caminar, including the acquisition of Healthy Partnerships in May and the merger with Project Ninety in June. Combined with the merger with Family & Children Services of Silicon Valley in 2017, we have greatly strengthened our capacity agency-wide to support and empower the complex needs of the most marginalized local individuals and families as they move toward resilience, wellness, and independence. Last year, thanks to the generosity and compassion of our donors, we served more than 20,000 individuals on their journeys toward progress and positive transitions. Throughout the year, we look forward to sharing with you more stories about the life-changing services you help to make possible. Our 2018 Annual Report will be ready next month. And, we have great transitions on the horizon, including introducing and welcoming a new CEO to Caminar soon. Stay tuned! Please mark your calendar for our 16th Annual Circle of Support Luncheon on April 26, 2019, in Menlo Park. The event will feature David Sheff, author of the New York Times #1 bestseller Beautiful Boy: A Father’s Journey Through His Son’s Addiction. Caminar was delighted to be a recipient of Transfiguration Episcopal Church’s generous and compassionate Advent Giving program this year. Approximately 75% of Caminar clients in San Mateo county come to us as homeless and often they have nowhere else to turn. Simple items such as clean, dry socks and rain ponchos help someone start the day on the right foot AND let them know someone cares about them and they are valued. 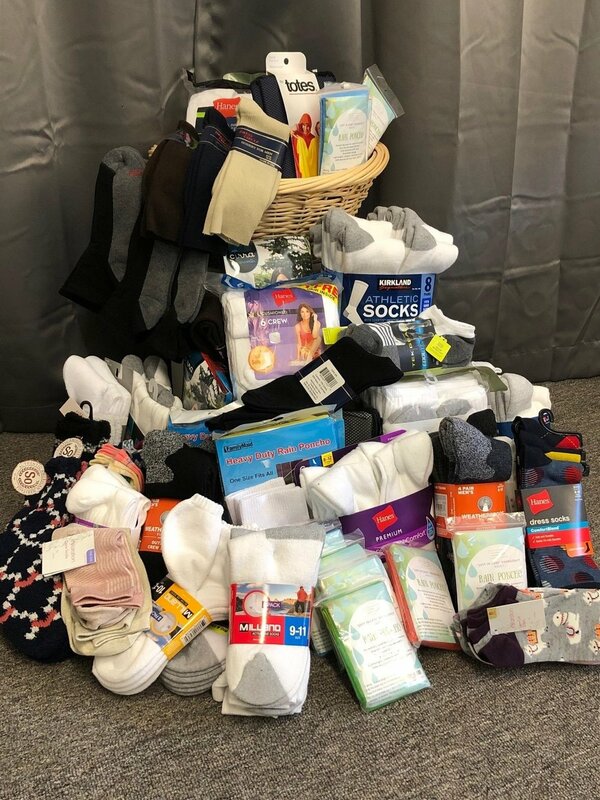 Over the course of December 2018, the Transfiguration community donated 123 pairs of new socks and 19 rain ponchos to Caminar for clients. And, the giving began immediately; within an hour of collecting these lovely gifts from under the tree at church, the items were brought to our medication clinic to be distributed to homeless clients ahead of first rain of the new year. Clinic staff was thrilled to be able to offer these gifts to our most needy clients and will continue to share these gifts throughout the season. Caminar is so grateful for the opportunity to connect with Transfiguration and for the beautiful outpouring of love and care that will help our most vulnerable neighbors. Thank you, from the bottom of our hearts. Growing up with bipolar disorder, Sam faced significant struggles in his home and school life. Throughout his teenage years, he bounced between “out of home” placements, compounding his emotional trauma. Sam’s challenges continued through early adulthood until he connected with Caminar’s services. Recognizing that Sam was a bright and talented young man in need of community and direction, his case manager urged him to enroll in school and linked Sam with the experts in Caminar’s Supported Education Program. The program’s Peer Counseling class at the College of San Mateo offered the perfect introduction to college life. Sam flourished in the class and found the confidence to continue his education. He then enrolled in the college’s Electronic Music program, where he learned to produce songs and shared his music at college performances. Since graduating, Sam has joined the workforce and moved into his own apartment. While continuing to experience life’s ups and downs, Sam works with his team at Caminar to manage his mental health condition, connect with community, and access the quality care that enables him to overcome challenges and continue moving toward his goals. Thank you to all of our donors and funders who provide support that allows Sam, and other vulnerable members of our community, the opportunity to live their best lives. With 2019 fast approaching, we look back on Caminar's impact in 2018. Because of the generosity of our donors and funders, more than 20,000 people last year made progress in overcoming major life challenges and moved toward greater resilience, wellness, and independence. From all of us at Caminar and our Family & Children Services of Silicon Valley, Healthy Partnerships, and Project Ninety divisions, thank you! Jason grew up in a state of turmoil. His parents divorced when he was a baby and he never knew his father. His life spiraled downward when his mom married an abusive alcoholic. He experienced abandonment and depression, never did well in school, and felt like he didn't fit in. To escape an abusive home life, Jason ran away and turned to drugs and alcohol. Jason connected with mental health and recovery services after time in juvenile hall. His life seemed to be heading in a better direction. But, drugs and alcohol lurked back into his life. After 15 years of substance abuse, Jason committed to change his life. On his 30th birthday, Jason knew he had to change his life for good. He sought treatment at Project Ninety. After completing our 90-day program, Jason continued on his path to wellness by becoming a Project Ninety volunteer and taking part in the 12-step recovery program. Recovery is possible with the right support. Today, with over three years of sobriety, Jason is thriving, enjoying life, and reconnecting with friends and family. He is employed in work where he is making a difference in our community and is continuing his college education. Jason credits Caminar’s Project Ninety division with helping him to turn his life around. Without the generous support of our donors and funders, Jason may not be here today. Caminar and our Project Ninety and Family & Children Services of Silicon Valley divisions combined to help more than 20,000 people last year overcome life challenges and move toward resilience, wellness, and independence. We couldn’t have done it without our circle of support. Our Supported Education program offers wellness and art groups in all Caminar residential programs and at our San Mateo office. These groups help engage one in learning, introduce new skills, and improve an individual's quality of life. The photography group meets weekly to learn more about the art of photography, hone skills, and take special outings to capture the local area. Here are some lovely photographs from recent group trips along the bay. Enjoy! With the help of Bridges to Wellness, our integrated primary and behavioral health care program, Michael* has a new-found healthy lifestyle and is working on remaining stable and resilient through life’s up and downs. Over a year ago, Michael, who is in recovery for severe mental illness, was connected to Bridges to Wellness by his mental health case manager. He received an alarming wake-up call when the Bridges to Wellness nurse reviewed with him the initial wellness lab test results. In addition to having extremely high levels of cholesterol, Michael was pre-diabetic. Smoking 40 cigarettes a day also was affecting his health. Motivated by the test results, Michael decided to make changes in his life. With the support of the nurse, he set wellness goals and created a plan. Encouraged by the Bridges to Wellness team, Michael began taking daily walks, which he found reduced his urge to smoke. Through the program’s smoking cessation group, he learned effective strategies, connected with peer support, and eventually quit smoking completely. Using his savings on cigarettes, Michael joined a local gym, where he works out most days. Now he is maintaining a healthy body weight and his cholesterol and glucose levels are within a healthy range. Michael is feeling, breathing, and looking better now than he can remember. 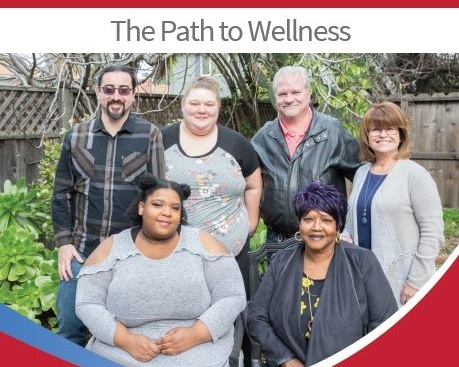 His own determination and resilience, along with support from our mental health and Bridges to Wellness program professionals, have helped him enjoy a healthier quality of life. With philanthropic investment, we aim to expand these integrated health services to reach more clients in San Mateo and Solano counties and to add services in Santa Clara and Butte counties. Many of our clients may not be on the path to wellness without the support we receive from the community. We are so grateful to our donors and funders who make the life-changing work of Caminar possible. 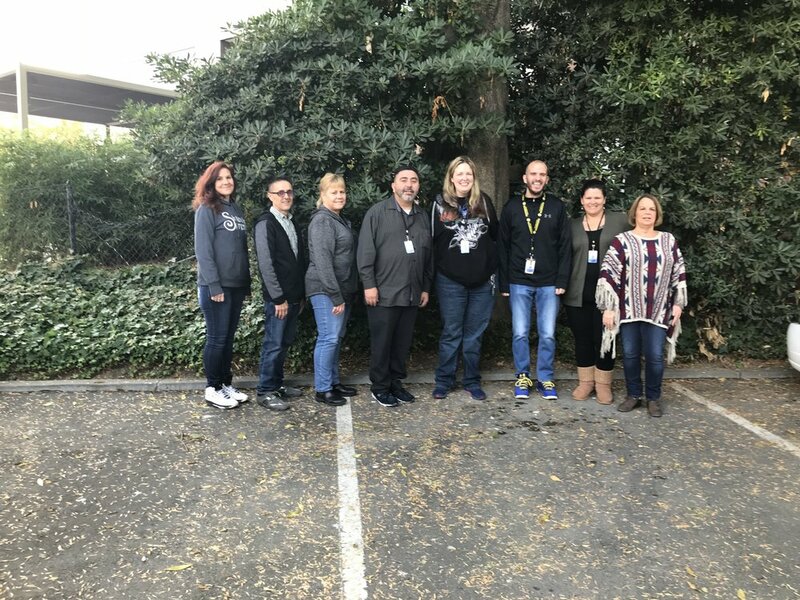 From left to right: Tiffany Cordero (Admin), Joe Iacocca (Program Manager), Amy Brinks (QA), Robert Thomas (Clinician), Jessica Ruddle (Clinician), Eric Covotta (Clinician), Karen Reed (Clinician), and Lori Freitas (Clinical Lead). Our Supportive Transition Empowerment Program (STEP), a program of our Family & Children Services of Silicon Valley (FCS) division, serves individuals in the Santa Clara County criminal justice system. The STEP team provides addiction and recovery treatment services for adults who are incarcerated and in need of continuing care on their recovery journeys. The team collaborates with clients, families, and systems to prepare for each client’s reentry into the community and then continues treatment upon release. This innovative and seamless coordination of care seeks to prevent relapse, promote well-being, and provide needed supports during the critical transition period following release. Some clients have been incarcerated for some years; the team helps to alleviate the disorientation and isolation clients can experience when adjusting to life outside. The program has grown and expanded since it began two years ago, and now also offers culturally competent services for adults who are LGBTQI (Lesbian, Gay, Bisexual, Transgender, Queer, Questioning, Intersex) at the Elmwood Correctional Facility. Assessments: The assessment component identifies a client’s individual needs and strengths. The counselor uses the information from the assessment to develop a transition plan, identify resources to which to connect clients post-release, and place the client in outpatient treatment and a recovery residence. Ongoing assessments are conducted to monitor a client’s motivation for treatment and evolving treatment needs. In-custody psychoeducation: Our in-custody treatment team provides psychoeducational groups, process groups, and referrals with a transition plan. Treatment: Our transition team meets with the client two weeks prior to release to help arrange for post-custody treatment, medication, transportation, and housing. Post-release: Our team links clients to treatment and recovery residences and assists clients in navigating the reentry process. Sasha Contreras, our clinician who provides outpatient treatment to the LGBTQI population as they are transitioned from in-custody to the community, and Roxanne Stone, who facilitates groups in the Main Jail and Elmwood. In addition, the team has resources to provide each client with a gift card for a hot meal, new clothes from the clothes closet, bus tokens for transportation to appointments, and other items that make transitioning from custody to the community more manageable. STEP Manager Joseph Iacocca, LAADC/CADC-II, and the team are focused on continually increasing the quality of care provided to clients, while also increasing support from the community to help clients stabilize as they are released from custody. Over the past six months, STEP has placed an average of 14 clients each month in treatment programs and 17 clients in recovery residences. The program is expected to grow, increasing the number of clients they serve and helping them transition back into the community from incarceration. You can find the STEP team at 2202 North First Street in San Jose. To learn more, please contact Joseph directly at jiacocca @ fcservices.org. A traumatic childhood left Peter with emotional wounds, severe depression, and PTSD. Eventually, his depression and PTSD became so debilitating, he was unable to get out of bed many mornings and missed so much work that he nearly lost his job. Peter was referred to Caminar’s transitional residential home, where he received support and time to recover from his mental illness, gain coping skills for his mental health conditions, and relearn daily living skills. The journey to wellness is paved with the right care and support. When Peter was ready, he returned to his life more prepared to manage his depression. Today, Peter is thriving. Once a shut-in, he’s now a lead carpenter with a flourishing business. He approaches each day as a gift. Peter credits Caminar with saving his life. Peter has a strong sense of community and gratitude, having benefited from the generosity, compassion, and support of others on his journey to wellness. To show his gratitude, Peter now volunteers his time and skills to help those in need. Without the support of our donors, Peter may not be here today. We are so very grateful for Peter’s wellness, and for the generosity of our supporters who make the life-changing work of Caminar possible.